Social news has many flavors. Twitter and Facebook function as social news feeds with your friends pushing out stories they find interesting. But what about news about your friends or other people you care about? Two Harvard sophomores, Axel Hansen and Jonah Varon, have cobbled together Newsle to do just that. Newsle imports your friends and contacts from Facebook and LinkedIn and shows you any news or blog posts that mention them. It also lets you follow famous people in different categories (actors, musicians, politicians, business people) to get all the news about them. Newsle recently launched in private beta. The first 1,000 readers to sign up with the beta key “techcrunch” will get in. The site lets you see a feed of news about just your friends, just public figures, or both. It emphasizes the public figures because otherwise, for most people, there wouldn’t be much news about just their friends. It constantly suggests more public figures for you to follow. The service scans hundreds of news and blog feeds and tries to disambiguate between people with the same name. It does a pretty good job of picking up items, and lets you filter out the random stuff by selecting “Important News” versus “All News” (although it still picks up duplicates, like when SAI pick up stories from other news outlets). Newsle doesn’t pick up Tweets or status messages, rather it tries to get rid of the social noise by presenting real news. You can, however, Tweet out news stories from your feed, vote them up or down, and add comments via Disqus. 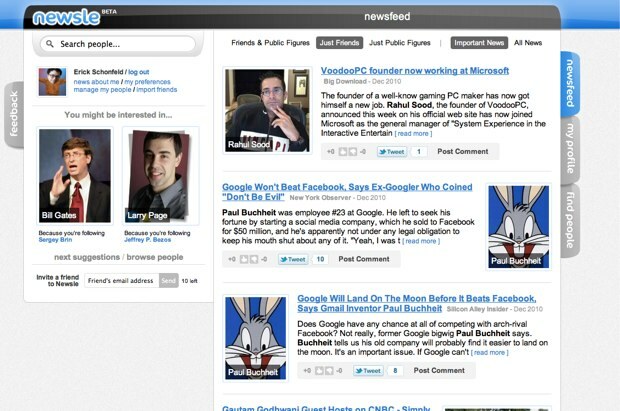 I have a feeling that Newsle will be more useful to the LinkedIn crowd (business people) than the Facebook crowd. Tracking news about people you care about could come in handy for startups founders tracking VCs or vice versa, sales people prepping for a metting, or simply keeping up with what is going on with your professional contacts. And if Newsle misses something, you can even add stories about yourself or your friends. 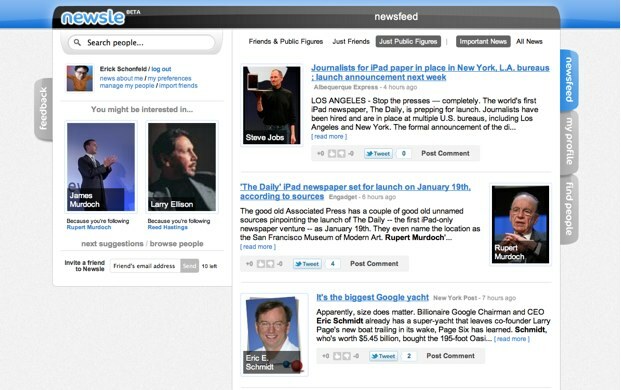 If Newsle sounds familiar, it is because the idea has been tried before. Rohit Khare and Samil Ismail launched a now-defunct company called Angstro at TechCrunch 50 in 2008. It picked up news about your LinkedIn contacts, and worked well, but it didn’t ever really take off. Angstro morphed into Knx.to and Khare was eventually acq-hired by Google. Getting news only about people you know turned out to be too limited a use case. Maybe Newsle will have better luck. It certainly wins points on the interface. And the emphasis on public figures might help it solve the problem of infrequent news items about your friends. Give it a try and tell Jonah and Axel what they can do to make it better in comments.